Sharp Galapagos Android tablet/e-reader details emerge. The Sharp Galopagos tablets as e-book readers will be available in two versions, a 5.5 inch model, as well as a 10.8 inch model. The 5.5-inch version comes with a 1024×600 resolution and the 10.8-inch version has 1366×800 res. Most versions will only have WiFi, but Sharp plans a Verizon edition with 3G. Both the Galapagos tablets and the readers will ship in December with a built-in e-book store that will have 30,000 ebooks available to download. 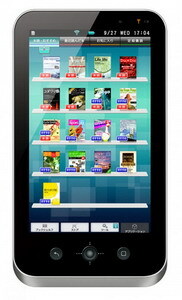 0 comments on "Sharp Galapagos Android tablet/e-reader to ship in December"